Research in Motion has put out the first 30 second TV spot for the BlackBerry PlayBook tablet, and it does a pretty good job of showing the appeal of a 7 inch tablet with multitasking support. The commercial shows off the app-switching gesture support, which is probably one of the tablet’s key strengths. The tablet has a high enough resolution display to handle a variety of tasks including web browsing, watching videos, reading eBooks, or looking up maps. At the same time, the 7 inch tablet is small enough to easily hold and carry with you in a variety of environments, as demonstrated in the video. 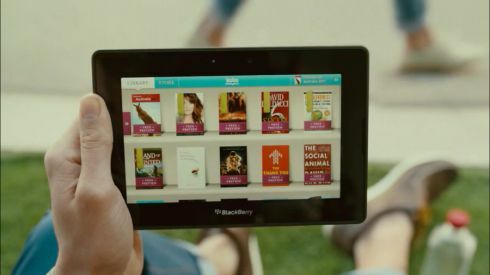 What the BlackBerry PlayBook doesn’t have is a screen that would look as bright and vivid in direct sunlight as the model shown in the video. It must be nice to live in a world where someone can just add the tablet display in post-production. Anyone but me notice that the hand actor swipes upward to activate the top menu which is actually activated by a downward swipe? if u have open apps and then u pull the full menu, swiping back again will bring back those. i just tried it on my playbook (which i am posting from right now).